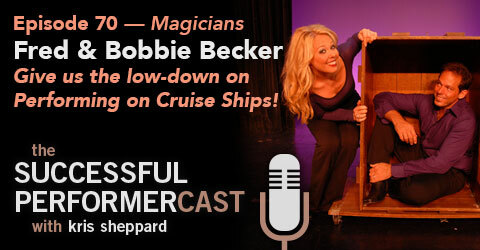 In this interview, Fred & Bobbie Becker talk all about the ins and outs of performing on cruise ships. They talk about the good, the bad, the unexpected, what sort of shows work on ships, promo videos, and on and on! Together Fred and Bobbie have 45 years of combined performing experience and spend their time performing on cruise ships! They also have a program for entertainers called Gigs on Ships where they teach the ins and outs of performing on cruise ships.